7 - 14 Nov 2003. Reinraum e.V., Düsseldorf. 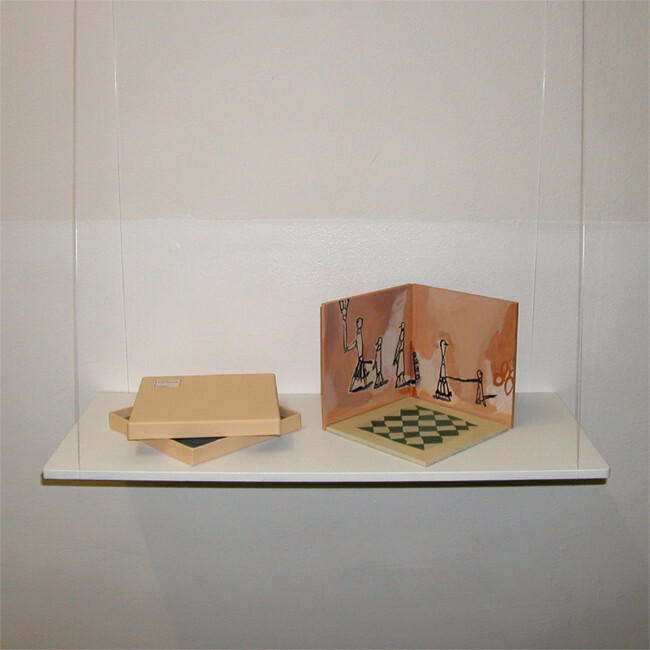 The intention of this show "Biblioscape" is to generate "book as place", through making its process with keeping each field of painting and music. We didn't have any theme in advance, and tried to find the outline of book in its arrangement from the process of its formation. At first, we prepared 20 sheets of folio size papers which are grounded in acrylic colours and a sound track of 75 min background music. Those materials have been filled on the wall and in space all of the time. In that situation, we did performance of 20-30min daily for 6 days. It was the process to make the territorial sea of story clearer and to fill up the interval between surface(=painting) and space(=sound), by circulation of drawing and sound making, which were generated at the same time. By means of daily work, pictures were written on papers and sound materials were recorded in hard disk. On final day, just as Yurihito reconstructed these sound materials and did 75min. 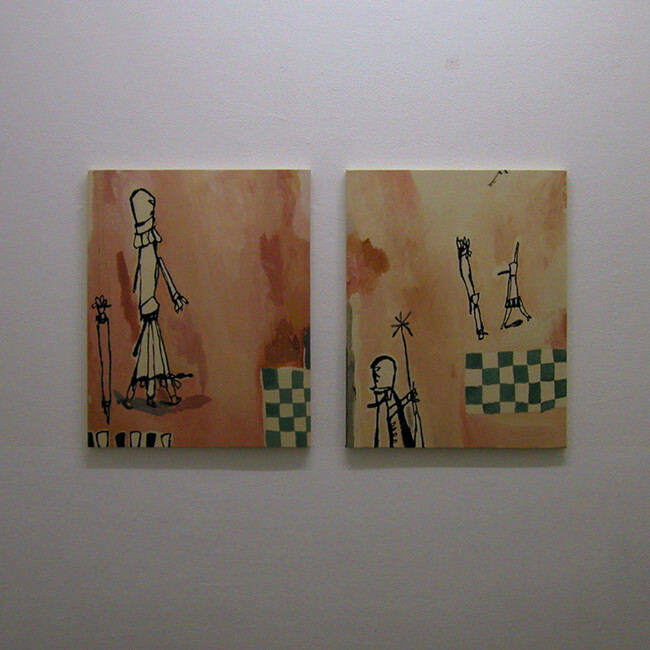 performance, so Mariko had took off pictures on the wall and put them in a folio size case. reinraum e.V. is in the center of Düsseldorf (Adersstr.30a, Düsseldorf, GERMANY). It is ex public toilet, which was renovated by local art lovers in 2002, and has been used as art&party space since then. There are 3 rooms for show (entrance, the 2nd room, the 3rd room). One of rooms has still lavatory basin, which has not be used anymore. There is also a small bar space (the 1st room) , which is opened during exhibition and event to cover some of the running cost. Vernissage in "Biblioscape": DJ:Detlef Weinrich, from "kreidler"
Biblioscape work in progress "mute libertine" 8-13 Nov.2003. In this unique space, as Yurihito had been making fragments of sound every day, Mariko had been doing drawings on the papers with his sounds. Under the title of "BIBLIOSCAPE", we tried to raise up nobody's memory from margin of space and time, and to open a book between voice and vision. 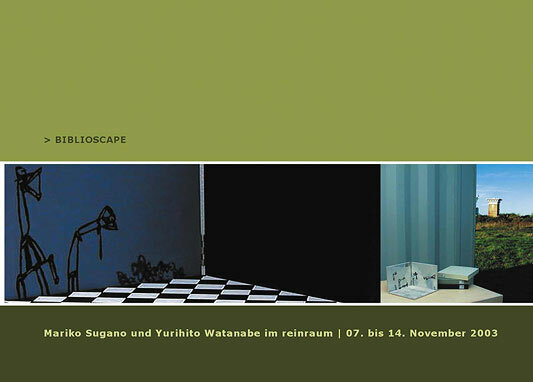 On final day, Watanabe had a live performance with sound fragments which had been made every day in reinraum. Works on papers "mute libertine" became "mutu liber" (mute book).